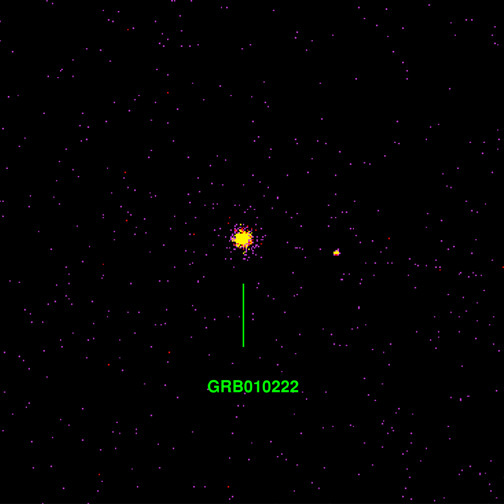 This Chandra image of the afterglow of a gamma-ray burst, known as GRB010222, provides evidence that these massive explosions take place where stars are born. Several theories exist about what causes gamma-ray bursts including various combinations of merging neutron stars and black holes, or, from the explosion of massive stars, called hypernovae. 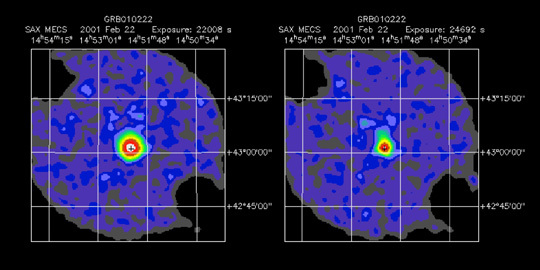 Using NASA's Chandra X-ray Observatory and the Italian Space Agency's BeppoSAX satellite, Luigi Piro of the Consiglio Nazionale delle Ricerche (CNR) in Rome, Italy, found X-ray evidence that supports the hypernova model. The data obtained by Piro and his team with Chandra's Advanced CCD Imaging Spectrometer suggest that the blast waves from gamma-ray bursts can hit a wall of very dense gas. According to the researchers, this barrier may be the crowded region where stars form. The hypernova theory of gamma-ray bursts suggest that the massive star required for a gamma-ray burst explosion evolves extremely rapidly – only over the course of about one million years -- within dense star-forming regions. Thus, the hypernova explosion may occur in the same stellar environment that originally produced the massive star itself, and perhaps may trigger even more star formation. Scale Image is 5 x 4 arcmin across. Coordinates (J2000) RA 14h 52m 12.0s | Dec +43° 0' 06.00"